Posted in: St. Louis Cardinals. 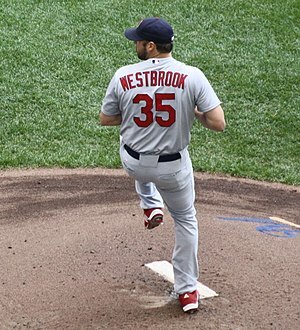 Tagged: Cardinals, Jake Westbrook, Westbrook. When Jake Westbrook was acquired from Cleveland in 2010 I said… “eh”. Typical no. 5 starter, with a decent sinker. But there is something about Westbrook that has proved to be so valuable in the Cardinals rotation the last 2 years… Consistency. We know what we are going to get out of Westbrook, something that I like a lot about him. He is what he is and that is good enough for me. The Cardinals ended up extending him to a 2 year, 16.5 million dollar extension with a mutual option for the 2013 season and here we are now. A contract year. Jake reported to camp this year having slimmed down and refocused. He knows this will be his last year in STL and he needs to cash in on one more contract. Then there’s this: He’s given up ZERO runs in his first two starts. I know, I know, there is the easy argument: “It’s a small sample size! !” But it’s fun to talk about. How else do you explain this? Are we witnessing Westbrook reinvent himself into something magical? No doubt Westbrook has been locked in, but here’s my problem. His walk percentage is 14.9%, way above his career norm. His batting-average-on-balls-in-play is .224 compared to a career average of .304. He has walked 10 batters in 15.2 innings pitched. It’s a number I don’t like and isn’t sustainable. He’s been getting abnormally lucky and the numbers concern me more than encourage. The surface level numbers are good but I don’t see anything that tells me this will continue. You know what I do like? That sinker is working. His ground ball to fly ball ratio is 1.72, matching his career high. He has been efficient enough to throw a complete game shutout against the Reds. He looks strong and his velocity hasn’t wavered. Look nobody expects Westbrook to win the Cy Young but I think he is vital in a rotation that hasn’t thrown a lot of innings in each members’ respective careers. Westbrook needs to be that workhorse. He needs to be him. If that’s 200 innings and a 3 1/2 ERA that’s okay with me.